Wild-caught Atlantic Cod in a white wine, lemon and caper sauce. Whether it’s dinner for two or dinner for just you, you can’t go wrong with the homemade taste of an Italian-style dish. We pair Atlantic Cod with a piccata-style sauce in an oven-ready tray—all you have to do is peel & bake. 3. Place tray on middle rack of oven and COOK for 28 to 30 minutes*. *FULLY COOK FISH TO A TEMPERATURE OF 145°F OR HIGHER AT THE THICKEST PART OF FILLET. 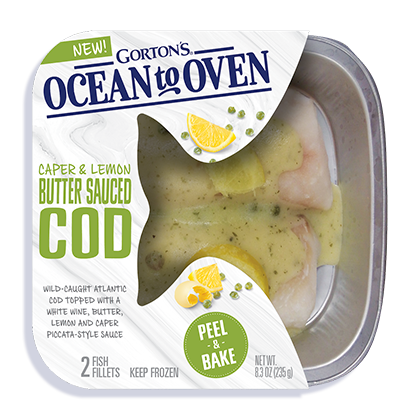 INGREDIENTS: Cod, water, lemon, butter (cream, salt), capers, less than 2% of: olive oil, Chardonnay white wine, dehydrated onion, corn starch, lemon juice concentrate, garlic puree, salt, sugar, spices, acacia gum, xanthan gum, citric acid. Produced in a facility that processes wheat, egg, tree nuts and shellfish.